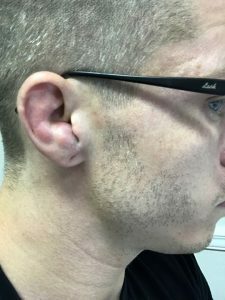 The term “Cauliflower Ear” describes a common injury to the ear that is sustained normally through wrestling, Brazilian Jiu Jitsu, Rugby and other sports where there can be potentially large or sustained impacts on the ears. It usually affects the part of the ear that is visible and leaves behind scarred tissue that can permanently deform a person’s ear. It’s very common in MMA and If you look closely at some of your favorite MMA fighters, you will notice some of their ears look like a dog’s chew toy. 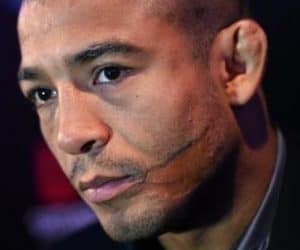 In the picture adjacent to this section, you can see Jose Aldo’s ear where he has scarred tissue as a result of cauliflower ear. This is what it looks like after it has healed and hardened. You can limit the deformity that is left behind by taking proper care of the injury while it is still fresh. The base of my ear canal is inflamed and clotted. 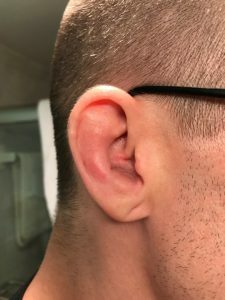 This happened as a result of getting my ear folded over itself during a grappling exchange. You can see the slight traces of my first bout with cauliflower in the smooth edges of the top part of my ear. First, let’s talk about what is happening in the ear. Your ear is made up of mostly cartilage. That cartilage attaches to a dense irregular connective tissue that’s known as the perichondrium. When you take an impact to the ear, a blood clot forms under the perichondrium and separates it from the cartilage. It’s a blood bubble that forms where you impacted your ear. The perichondrium is what supplies nutrients to the cartilage of your outer ear, when that supply is cut off, the cartilage begins to die. When it dies completely, it will form a hardened fibrous tissue that can only be removed later with cosmetic surgery. This is what you see in Jose Aldo’s ear above. You want to make sure you take care of it before it hardens to mitigate the resulting tissue deformity. The first thing you need to do is make sure it’s actually cauliflower and not just a little swelling. If you feel around on it, it should feel like a tiny water balloon under your skin. Massage it and move the blood around periodically until you are able to drain it, this keeps the tissue from hardening. You will need alcohol or some other disinfectant, some gauze pads, a syringe, and a form of compression (discussed later). Your first hurdle in this process will likely be acquiring a syringe. This can be difficult depending on what state or city that you are in. Typically, pharmacists will not sell you a syringe without a prescription out of fear you are using it to do hard drugs. MMA fighters normally have bruises on their faces (especially after a training session that resulted in cauliflower ear) and that coupled with a big blood bubble on your ear is usually enough for a Pharmacist to give you the side eye and send you packing. If this is the case, look for a friend who is a nurse or an EMT, they can frequently be found in MMA gyms if you look hard enough. If you can’t find a friend who is an EMT, put some glasses on, wear a shirt with sleeves, and appear respectable. When you walk up to the consultation at the CVS, ask them if they know what cauliflower ear is. If they do, you might be in luck, tell em’ you’re a wrestler/grappler/UFC fighter and explain to them that you need a syringe to drain your ear by showing them your big ole’ blood bubble. If they wrestled in high school or know at least a little of what you are talking about they will likely sell you a few syringes seeing that you are clearly not a hard drug user. Its worked for me several times in Florida. If it doesn’t work, bring your mom with you, no one does heroine with their mom. If that doesn’t work either, get health insurance and have a professional drain your ear for you. Buy/acquire at least 5 syringes if you can, you will likely have to drain your ear multiple times if its bad enough. Now that you’ve pulled out the blood and your ear looks relatively normal again, clean everything again and breathe a sigh of relief. You’re basically done. The next step is to apply compression to the affected area. If you don’t compress the ear immediately and for the next 72 hours, the blood bubble will fill back up again and you will need to repeat this draining procedure. 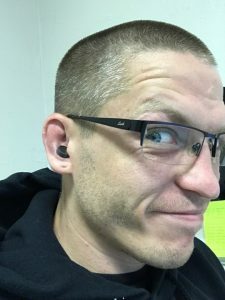 If you can’t take some time off the mats to let your ear heal completely because of impending competition, prepare to be draining your ear pretty regularly until you can. **This is intended to inform and entertain only. We are not medical professionals and highly recommend that you see a licensed physician for cauliflower ear whenever possible.